Definitely does not sound like an insult, then (and I can't imagine Macnee ever insulting any of his co-stars). It sounds like he's mostly saying that she's a slender woman. Again, though: Diana Rigg? Boyish? Because...boys look like that? I can safely say that boys do not look like Diana Rigg. Yeah, man, Diana Rigg totally looks like a boy in Honey for the Prince. All boy. No woman there at all. None. 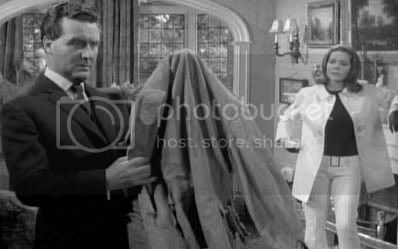 Oh, and Steed's suits are amazing and the man looks great in them. And, presumably, out of them, which we really should have had more of. But at least we got tight trousers in Too Many Christmas Trees and A Touch of Brimstone and some very nicely cut open shirts in Season 2. Yes please. 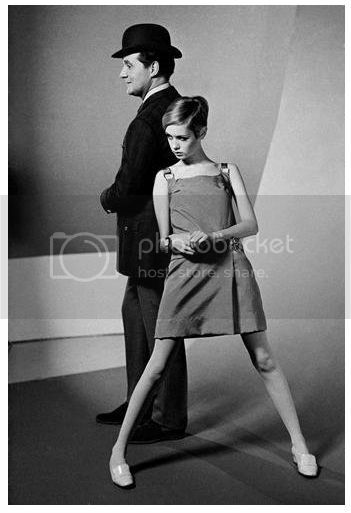 "Boyish" usually refers to the kind of twiggy fashion models who don't have hips or breasts - indeed, Twiggy posed with Macnee in many Diana Rigg era costumes. Just seemed to imply 'not womanly/feminine,' which is not true. That's all. "A boyish figure" is quite a common expression to talk about slim young misses (or light-boned ones). I'm surprised it hasn't crossed the Atlantic. I do agree it doesn't really apply to Diana - unlike Twiggy, Diana very definitely has curves. No, I've heard the expression before. It just doesn't seem to apply to Diana, or really to Joanna Lumley either. Part of that marking off one type of woman as "like a woman" and another as "like a boy." Does not seem complimentary to me. In the '70s such kids were called in UK schools "Belsen boys" or likened to Cambodian, Ethiopian or Biafran famine victims. I wonder what was wrong with her. Twiggy was naturally like that. She's been very outspoken about the bad images perpetuated in fashion that contribute to anorexia. I have a young friend who has just got into fashion modelling and doing very well - she is stick thin and hated her legs growing up. She used to layer loads of tights on her legs to make them thicker. She'd get called anorexic at school for her skinniness. She's since learnt to accept her shape and it's certainly getting her lots of work. 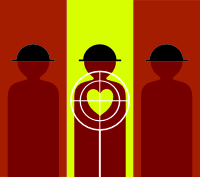 The fashion industry sadly doesn't celebrate all shape, designers all stick to the one slim figure. As for why Twiggy is modelling with Macnee. She was massive at the time - it was probably great publicity! Critique of women's bodies wasn't exactly unknown in the 1960s. Even look at Diana Rigg, a naturally slim woman: she got even skinnier for Emma Peel, and then was promptly criticized for having small breasts and slender hips. Linda Thorson was "shaped like a woman" (whatever that means), but put on diet pills. Unless you were perfectly proportioned, according to the whims of what was considered "perfect" at any given time, then it seems actresses came in for a great deal of criticism. Oh, and if you WERE perfectly proportioned, then you weren't taken seriously (Marilyn Monroe). It continues to be true today - witness the way commentators tore into Kim Novak's appearance at the Oscars (this is a legendary actress who survived a bout with cancer and serious injury, but caught hell for having had visible plastic surgery). The constant pulling apart and fragmentary critique of women's bodies is very troubling, and continues to be troubling. There. I'm off my soap box. The Avengers women are all gorgeous and they don't come down to just bodies, thank God. Purdey/Joanna seemed fairly strongly fit and athletic in her movements though, which is not surprising given the punishing training and fitness schedule they did before shooting. I didn't worry that in a fight she might get a limb snapped, whereas Twiggy would break her arm lifting up a cup of tea!